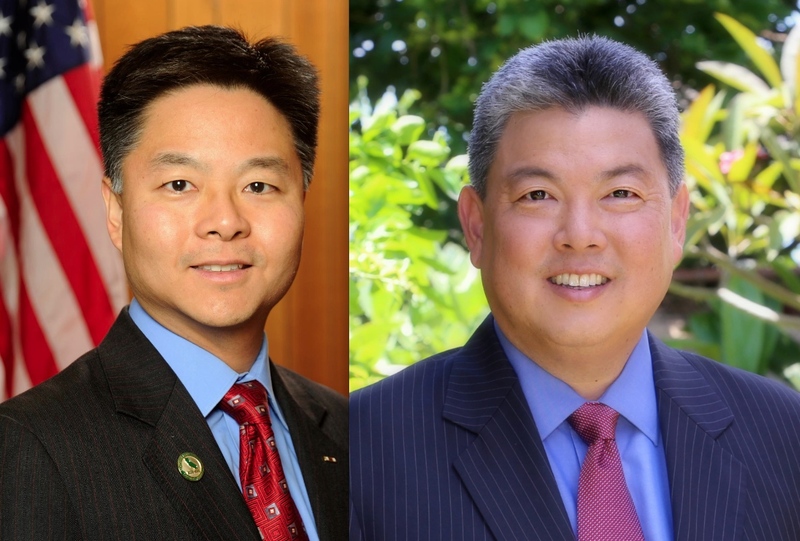 Most of the Asian Pacific American members of Congress were re-elected in the Nov. 4 elections and two new members were added. • Newcomer Mark Takai was elected to represent Hawaii’s 1st Congressional District (Honolulu), defeating Republican Charles Djou, a former member of Congress, 93,360 (51.2 percent) to 86,419 (47.4 percent). Takai served for almost 20 years in the Hawaii House of Representatives. He replaces Rep. Colleen Hanabusa, who gave up her U.S. House seat to challenge incumbent and fellow Democrat Sen. Brian Schatz in the primary. Schatz won the primary and the general election. • Rep. Tulsi Gabbard (D-Hawaii), who represents District 2 (rural Oahu and the other islands), easily fought off a challenge by Republican Kawika Crowley, 141,996 (75.8 percent) to 33,624 (17.9 percent). Born in American Samoa, Gabbard is an Iraq War veteran and the first Hindu American in Congress. • Rep. Judy Chu (D-Pasadena), chair of the Congressional Asian Pacific American Caucus, was re-elected with 57,819 votes (58.3 percent) to Republican Jack Orswell’s 41,309 (41.7 percent). Previously a member of the California Board of Equalization and the State Assembly, Chu has been in office since 2009. • Rep. Mark Takano (D- Riverside), CAPAC whip, won a second term by beating Republican Steve Adams, 38,755 votes (55.9 percent) to 30,621 (44.1 percent). Takano, who served on the Riverside Community College District Board of Trustees for 22 years, was first elected to Congress in 2012, defeating Republican John Tavaglione. • Rep. Mike Honda (D-San Jose), CAPAC chair emeritus, was leading his challenger, Ro Khanna, 66,338 (51.8 percent) to 61,701 (48.2 percent) as of Monday. Honda declared victory and Khanna conceded on Friday. Honda, who easily fought off Republican opponents over the years, faced a serious threat from fellow Democrat and fellow Asian American Khanna, who described himself as “a new kind of leader for the challenges of a new century.” Honda, who has been in office since 2001, was supported by the Democratic establishment, including President Obama, while Khanna had the backing of Silicon Valley technology leaders. • Rep. Doris Matsui (D-Sacramento) was re-elected by a wide margin, 66,679 votes (72.0 percent) to Republican Joseph McCray Sr.’s 25,958 (28.0 percent). Matsui has been in office since 2009. • Rep. Tammy Duckworth (D-Ill.) won a second term in Illinois 8th Congressional District (suburban Chicago), beating Republican Lawrence Kaifesh, 79,651 votes (55.4 percent) to 63,997 (44.6 percent). In 2012, Duckworth, an Iraq War veteran who lost both legs in combat and has served as a lieutenant colonel in the Illinois National Guard, defeated Republican incumbent Joe Walsh. Kaifesh also had military credentials, having served in Iraq and Afghanistan. • Rep. Grace Meng (D-N.Y.) of the 6th Congressional District (Queens) ran unopposed. She was first elected in 2012, defeating Republican Daniel Halloran. She is the first Asian American to represent New York in Congress. • Rep. Bobby Scott (D-Va.), representing the 3rd Congressional District (Richmond, Hampton), was unopposed for election to his 12th term. First elected in 1992, Scott was the first American of Filipino descent and only the second African American to represent Virginia in Congress since John M. Langston left office in 1891. • In American Samoa, Democratic Rep. Eni Faleomavaega was unseated by Republican Aumua Amata, 3,571 votes (30.8 percent) to 4,306 (42.0 percent). A total of nine candidates sought the position. Faleomavaega was first elected in 1989 and was previously lieutenant governor. Amata, who worked as a congressional staffer in Washington, D.C. for 10 years, will be the first woman to serve as American Samoa’s non-voting delegate in Congress. • Gregorio Kilili Camacho Sablan, the Northern Marianas’ delegate in Congress, was re-elected. First elected in 2008 when the seat was created, Sablan caucuses with the Democratic Party but ran an as an independent. His opponent was Democrat Andrew Sablan Salas.